Hotel President, built at the highest hotel standards, is considered one of the best hotels in the area of Slatina and Olt county. Hotel President opened in 2008, after extensive modernization work. PRESIDENT Hotel is on the European road E-70, between Pitesti and Slatina localities, in a excellent natural scenery that is very near to Scornicesti . 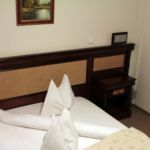 The facilities and services that are offered: Hotel PRESIDENT wants to impose new standards in terms of hotel accommodation in the area of ​​Slatina and Olt. Reserve your accommodation and Hotel President Scorniceşti will directly send the confirmation in 1 workday.